April 4, 2006. 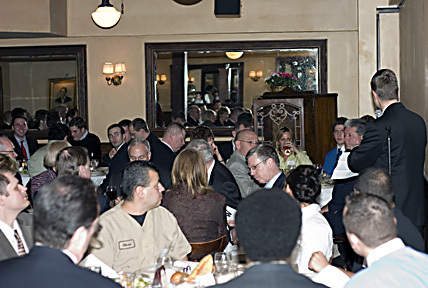 A filled-to-capacity room of Wabash alumni and friends greeted Anne and Andy Ford in Chicago on what is likely to be the Ford’s last official visit to the Windy City. The Fords were attending the annual Wabash Club of Chicago Alumni Admissions dinner at the downtown Maggianos. Several prospective students and their families were afforded Wabash style hospitality by the Chicago Club – it was an opportunity to see the very best of the College community. Wabash Club co-chairman Greg Jania ’93 served as the evening’s emcee. After dinner, Greg thanked the Ford’s for the tremendous leadership and vision they had provided to the College and presented them with a brass Wabash coaster set in a beautiful mahogany chest. At one point in the evening, one prospective student stood up and told the group his decision was made – he’s attending Wabash in the fall! As they say: "And the crowd went wild…"
Many thanks go to Wabash Club of Chicago co-chairmen Greg Jania ’93 and Eric Schoettle ’93 for putting together a great evening. Thanks as well to young alumnus coordinator Khurram Tahir ’01. These three individuals have really energized the Chicago area alumni effort. Photo: Emcee Greg Jania '93 welcomes the group to the evening's dinner.